I have a confession. I used to apologize for my daughter being gifted. Focusing on the positive side of parenting a gifted child. You’d think she could figure out how to hang up a towel! Ok, that last one really bugged me. Seriously, how tough can it be? I admit to telling her to stay in the bathroom until she figured out how to put the towel on the towel bar. It was either my worst parenting moment or my finest. The jury’s still out. Now, I don’t mean that I said these things with earshot of my daughter or even that I said them very often. But I did say them. It happened most frequently when we were early in our gifted kid journey and someone, usually another mom, would comment about how well she was doing in school or the grade skip and I would immediately downplay things by pointing out something she wasn’t so good at. Ugh. What was I thinking? Who knows why I said those things. Or why any of us do – because I know I’m not the only parent of a gifted child who’s done this. Probably a combination of wanting her to fit in, me wanting to fit in, a bit of imposter syndrome (on my part) and simply not really understanding what the heck we were really dealing with. I also think it was the adjusting of expectations. We knew she was an exceptionally bright little kid but didn’t really know until she got to school how exceptional she was. We had no clue of what being on the far right of the bell curve meant. She did learn how to tie her shoes, but sometimes it takes a couple of tries so that the tightness is equal on each foot. Don’t laugh. I know you know what I mean. Still not big on basketball but she’ll shoot baskets with her dad. Only once in a while – but he has to ask nicely and there are bribes involved. I know she can hang towels up but she sometimes chooses not to. We’re working on it. Sure, there are plenty of things she’s not good at. But I’ve stopped focusing on them and I’m choosing to focus on the positive because the positive things FAR outweigh the negative. 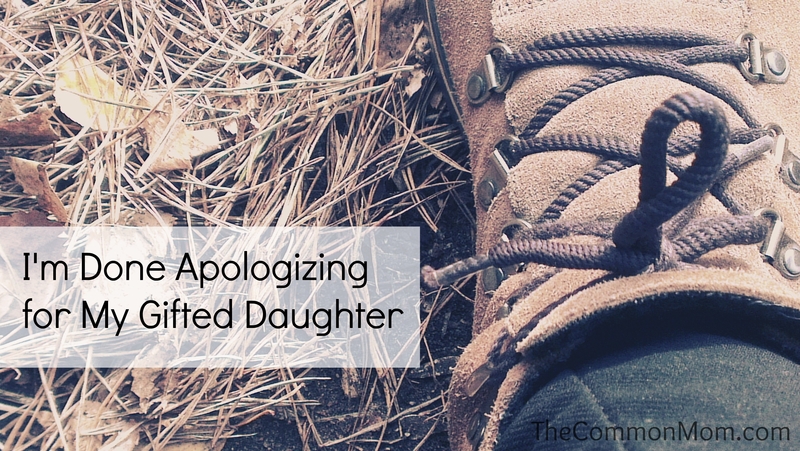 My daughter is gifted and I’m done apologizing for it. What about you? Any regrets or things you wish you had done differently on your journey? Oh boy can I relate. I used to make excuses or try to explain the giftedness all of the time, but I never really stopped to consider why. Maybe to temper what seemed to others like bragging? To show others that it’s not all sunshine and lollipops?? To make others feel better??? It’s nuts! So I’m going to make a new years resolution – no more excuses, no more focusing on the negative, no more “explaining” so she seems more “regular”. My kiddo is fabulous and I am as proud as I can be – regardless of whether she remembers to hang up her coat or not! Thanks for the proverbial “kick in the pants”! Hallelujah!! You DO have a fabulous kid and there’s not a thing in the world wrong with expressing your pride and amazement at her accomplishments and abilities. And to think, she is still learning and growing and becoming the incredible person that she has been developing into since the day she was born!! Proud of her?? How could her mom, dad, Grammy and Poppa NOT be proud, after all she is really a triple miracle child!!!! Letting others know about her specialness is just telling the truth about our family’s awesome girl!! Hugs from Mom……. I am cringing a little in my seat right now because I have said things like that about my little guy. You are so right. I am going to work on just saying thank you! I know, I cringe when I think about those things I said. It gets easier and you’ll feel better! Thanks for the great article. This is such a great point – learning to accept the compliments about your child and not having to apologize. I know I often felt compelled to downplay comments to equal out the playing field, and it took a while to just accept the compliment. Interestingly, when I was working on a recent blog post, I read an article that actually advised parents to complain about their child’s weaknesses when discussing their child’s abilities with other parents. We need more posts like yours encouraging parents to feel that they can stand up for their child’s strengths without shame. Thanks again. Thank you for the kind words. I understand about trying to level out the playing field but I finally decided I didn’t want to do that by bringing my daughter down. I just try and remember that words really do matter. I agree with Gail. My kids are not academically gifted, I happened across this blog looking for ‘common mom’ discussions, but a lot of moms face these same issues. I found when I tried to minimize my kids’ achievements or focused on weaknesses rather than strengths it made the other moms look down on/think less of my kids. So I refocused and now try to share strengths without bragging, and do a lot of asking rather than talking! Having said that, I do have a small group of close friends that I share the good, the bad, and the ugly with. We all need to be able to do that. But the playing field is not level – everyone is different. We need to find joy in the blessings/talents we have. My kids also leave the towels on the floor, have ‘perfection’ issues, and have to be ‘bribed’ to try some things; I think those issues are universal. Thanks for the post – it’s always nice to remember we all go through similar things! I LOVE this post! It is a great reminder, because I do it to. You are right. It’s time we stop apologizing! I know – it’s a bad habit that most of don’t even realize we’re doing. Thanks for dropping by! Thanks! Just visited Your Rainforest Mind – looking forward to what you have to say! Ummm…were we separated at birth?? Just found your blog and I’m sure we will have plenty to chat about. Thanks for stopping by and stay warm up there! We have a later one saying what we do say now, relating to Mindsets. So, not just “Thank you” but also sometimes, “Yes, he loves to read” or “Yes, she works really hard at that.” Because they always say things like that in front of the kid as if he or she isn’t there. Yes. Well said. I too have tried to stop apologising for my kids. It was making me look at them and only see their faults. Stopping that way of thinking freed *me* more than them. Thankyou for a very timely reminder on being mindful of what I say about my kids. You’re right, we need to spend more time on the positive and less on the negative. I have spent a lifetime doing this about myself. You learn very early that girls aren’t supposed to be smart – I was told every day in a thousand ways. Other people’s insecurities were somehow my problem, apparently, because my job was to make everybody feel good. Being around somebody smarter than they were made them feel inadequate. If I acknowledged that I was smarter than they were, I had failed. I live in hope that things are changing. That as we’ve moved ahead to a place where women have more control over their lives and more options for what they will do in the world, it’s less necessary to try to hide and make everybody comfortable with differences. I hope that things are changing for our daughters so that they don’t go through what you and so many of us did. I feel that they are but I remain vigilant. Thanks for stopping by and sharing your thoughts. You know, as much as I admire your self-awareness and agree with your reasoning, I can’t help but think that if you had not put your daughter down to other parents, the other parents would have done it themselves. It happened to me. Adults were just waiting for me to fail. My grade 3 teacher did it. Made fun of me in front of the class for getting answers wrong. After that, my best friends started calling me names, running away from me when I tried to play with them, sometimes physical confinement (arms around me) until I cried, which was the object of the game. I learned that my real self was not lovable. I am 36 now and still cannot be joyful in public without a physical level reflexive backlash of anxiety (I call it a “shut-down”). So when I saw me alone, and them together, me rejected and them belonging, how do I look at this and not conclude that my well-being wasn’t worth as much as the other childrens’? How do I look at this and not conclude that since it was “innocent children” who bullied me, (and adult teachers who allowed or even condoned it) that they must have been instinctually eliminating the weak link in the gene pool? If this were prehistoric times I’d have been left behind to die. I tell people this evolutionary weakness conclusion and they say “that’s harsh”. Well, who cares if it’s harsh if it’s true? This is in fact how my fellow humans treated me. Furthermore, a Network Spinal Analysis chiropractor told me at a workshop that if I did not change my lonely feelings and slouched posture, I would be like the sick animal that the rest of the herd leaves behind. I have had years of both conventional (talk therapy) and “fringe” therapies (some hypnosis and mind-body oriented stuff) and I can’t resolve this. So I don’t expect therapy or advice from you, I am just venting. I understand the need to vent and I hope you feel safe to do it here. Thank you for sharing your story. You probably won’t see this, since it’s been a year since your comment and I jsut found Common Mom’s uncommonly good blog. My sister – who went through much the same, 10 years later, tells me it was jealousy. Our parents (also gifted) were very involved and very much in love – and this was in the late 70’s-80s when moms suddenly entered the workforce en masse, divorce became more acceptable… and society was in an upheaval, but *we* weren’t. I believe her… but I don’t care. What saved me was that my parents – out of desperation – began homeschooling me and I didn’t “go back” till college (where I found “my people). Ten years later (the year I started college) they took my sister home (3rd grade). I’m 42, happily homeschooling my 6 kids (who can go to school if they really want, but have never been exposed to that directly). My gifted husband understands (his school experience seems not quite as bad). *sympathy hugs* from one who understands. And best wishes in finding the path out. Thank you! I have done a lot of apologizing for my 10 year old daughter over the years trying to make others more comfortable. It’s only been in the last year I have realized that it was her I should have been apologizing to. Now when people mention something she does well I just say thank you and I’m proud of her.